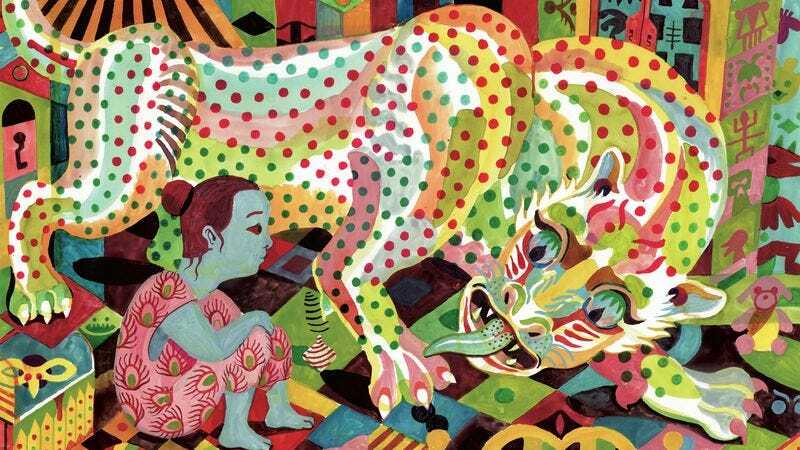 Brecht Evens’ graphic novel Panther tells the story of a young girl and her feline imaginary friend, so it’s totally understandable for readers to expect Calvin & Hobbes-style all-ages hijinks in its pages. Panther is not that book, though. Yes, Christine’s imaginary friend is adorable, and there’s plenty for kids to enjoy in both the mystical story and lush painted artwork. But the narrative goes to some very dark territory as it moves forward and explores the true nature of the titular character. Evens gradually reveals that Christine’s new companion is far more predatory than he initially seems, and their early interactions have deceived both Christine and the reader by presenting Panther as a lovable, jovial creature. This excerpt shows the end of Christine’s first meeting with Octavianus Abracadolphus Pantherius (Panther for short), and it spotlights Evens’ immense range of character expressions as well as his strong understanding of how to use color to intensify those numerous emotional beats. Panther’s dreamlike quality is accentuated by his constantly shifting form and palette, and it’s easy to see why this bold magical being enchants Christine. Readers can fall under Panther’s spell by picking up the graphic novel in stores or online now, but they should be wary of the sharp teeth behind that sly smile.